Rumored picture of the phantom iPod. Come on, everyone. How does this rumor still get started every 6 weeks? Engadget is reporting more rumors of the again-supposedly-imminent release of a widescreen, fullscreen, touchscreen video iPod. Once again, the geek community will spread this rumor like wildfire and its existence and release date will graduate from rumors to assumed facts. This behavior will be quickly forgotten when the supposed release doesn't happen. Rumors like this spread because people want them to be true. Apple's rumors are particularly viral on the internet, possibly because many readers and influential members of the whateversphere are Apple fans, or maybe because people really like Apple and Google and want everything they do to kill Microsoft, or probably because iPods are really great. Video isn't the next big thing. Yes, Google just bought YouTube for an insane amount of money. But that doesn't mean that there's a significant portion of people who use portable video. Computer video consumption is still limited primarily to watching quick clips while sitting at a computer, not watching feature films on little portable screens while walking (or, heaven forbid, driving) to work. The vast majority of people only want portable devices to play music and make phone calls. Hardware still can't do it well. The recent update to the video iPods bumps up the battery life on the 30 GB model to approximately 3 hours of video playback. It's a great improvement, but it's still pitiful as a video device, especially since many people depend on their iPods holding a charge throughout their entire work day for music playback. And these battery-life figures are for a much smaller screen. LCD backlighting is the largest power drain for portable devices by far, and a "widescreen iPod" of the rumored size would have almost 3 times as much screen area as the current video iPods. To accommodate a full-face screen, plus the massive battery required to get reasonable playback time from it, the iPod would need to be much thicker and heavier. Touching = fingerprints. 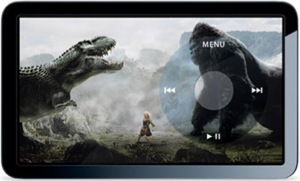 The most important feature of a video playback device is its screen. It needs to display high-quality video on a bright, color-saturated, low-lag LCD with a minimally reflective and highly scratch-resistant coating. With such care needed for optimal screen viewing, why would you want to require users to cover half of it with fingerprints constantly? This just isn't a well-thought-out interface. Apple isn't in the business of making half-assed products. They're not going to release a thick, heavy, expensive device that nobody will use in order to provide a feature nobody wants that's half-covered in fingerprints.